If you were thinking that Kyle Busch was going to slow down, you thought wrong. Busch started on the outside pole in Saturday’s 21st Annual TruNorth Global 250 NASCAR Gander Outdoors Truck Series (NGOTS) race at Martinsville Speedway and dominated the race by winning Stage 1 and leading 174 of the 250 laps en route to his 38th win for Kyle Busch Motorsports and his 54th victory in 148 NGOTS races. It was also his 201st national series win. However it didn’t come easy for Busch with late race restarts and he also had to hold off Ben Rhodes. Nonetheless, after all was said and done, Busch continue his winning ways at Martinsville. The race got underway with the first stage being 70 laps. And surprisingly enough, it was caution free for the most part, which is unheard of at Martinsville. It wasn’t until seven laps to go when Gus Dean’s truck caught fire and brought out the first caution. With the limited amount of laps left for a restart, the stage ended under caution and Busch won Stage 1. Johnny Sauter also had issues with his truck that possibly saw a cylinder going down. Stage 2 was green on Lap 79 and was pretty much the same as the first stage. Ross Chastain went to second on Lap 91 and another caution flew on Lap 117 for Daniel Sasnett, who spun around. Busch pitted with a few others under caution, while Stewart Friesen and Ross Chastain stayed out. Chastain took the lead with 10 to go in the stage and on Lap 140 and won stage two. With 99 to go, the green flag was back out for the third and final stage. Chastain led until 65 to go when the eventual race winner, Busch retook the lead. But it wasn’t easy for him for the rest of the way. Sauter had a left-rear tire go down with 63 to go and Sasnett spun again one lap later. Another incident took place with 40 to go, as Cory Roper spun in Turn 2 setting up another restart. Rhodes moved into second place and spent his time trying to catch the No. 51 of Busch. It looked liked Rhodes had his chance with eight to go, when Tyler Dippel spun, bringing out the caution and setting up a late race restart with three to go. 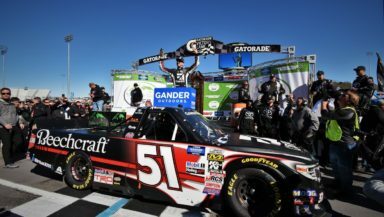 Rhodes gave it all he could, but his truck wasn’t enough for Busch as he went on to win his second career Truck Series race at Martinsville under caution. Busch has now won three consecutive Truck Series races this year. He will have two more left at Texas and Charlotte.